Once upon a time, there lived a poor woodcutter in a small village. He was hard working and honest. He had a neighbor who was also a woodcutter. But he was a lazy man and never went to work. One day the honest woodcutter went to cut trees in the nearby woods. “Oops! There aren’t many trees here”. I’ll walk up to the river”, he thought. “Wow! Such a beautiful place. It's full of trees here!” I’ll cut one.” said the woodcutter to himself. Soon he started cutting a tree. And Lo! His axe fell into the river. “Oh! No”, shouted the woodcutter. “Oh! God, what shall I do now? How can I earn money now?” he sat on the river bank and cried bitterly. Suddenly, there was a dazzling light on the river. He was surprised to see the river goddess in front of him. “Why are you crying, my child?” asked the goddess. The poor woodcutter sobbed and narrated the incident. “Don’t worry,I will get back your axe”, said the river goddess and disappeared. Within a moment, she appeared with a shining gold axe.“Is this your axe?” asked the goddess. “No mother, this is not my axe” said the poor woodcutter. The goddess again disappeared and reappeared this time with a silver axe in her hand. “Is this yours?” she asked. “No. This too is not mine”, said the woodcutter sadly. This time the goddess went back and returned with an iron axe. “Is this yours?” asked the goddess.“Yes. This is the one I dropped”, the woodcutter shouted with joy. He thanked the goddess and took his axe. “I’m very much pleased with your honesty, my child”, said the goddess. “Take these two axes as a reward for being honest and truthful”, saying so, the goddess gave the gold and silver axes as well to the poor woodcutter. He was overjoyed for the kindness of the river goddess and thanked her again. He poor woodcutter returned home happily with all the three axes. His lazy neighbor came to know about the incident. Now he too wanted to get the gold and silver axes from the river god. The next day morning, he too went to the river bank and purposely threw his axe into the river. He acted as if he was crying. Like the previous day, the river goddess appeared in front of him. She asked why he was crying. The greedy woodcutter told her that his axe fell into the rive. The greedy woodcutter said hurriedly, “yes, yes, that’s mine. Give it to me”. And lo! 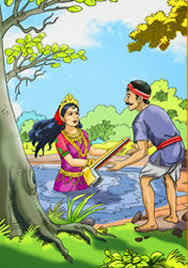 The river goddess became too angry with the woodcutter for he was dishonest. She shouted at him, “Get out of here you lazy, greedy man”. You have cheated me," saying so she disappeared. The greedy woodcutter did not get the gold and the silver axes. On the other hand he lost his own old iron axe. He felt sad for losing his own axe. He learnt that he should always be honest and truthful. Be honest and truthful and never be greedy and cheat others. Honest is the best policy. Click to read more moral stories.